A couple of weeks back, I had received a question from one of our TAMs in regards to automating the disablement of specific TLS/SSL protocols for their ESXi 6.0 Update 3 hosts. As of vSphere 6.0 Update 3 and vSphere 6.5, customers now have the ability to completely disable TLS 1.0, TLS 1.1 and SSLv3 using the new TLS Reconfiguration Tool. Mike Foley did a nice write up here if you are interested in more details. The TLS Reconfiguration Tool works well if you have the same version of vSphere for both your vCenter Server and ESXi host, but has challenges when you are in a mixed environment like this particular customer. In their environment, they are running vCenter Server 6.5 and ESXi 6.5 Update 3 which prevented them from using the TLS Reconfiguration Tool as this is a limitation with the tool today. 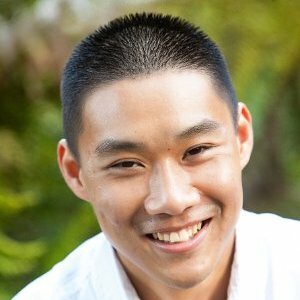 Given the TLS Reconfiguration Tool was written in Python, I was able to take a closer look at its implementation and I found that the settings that controlled the disabled protocols were just merely a few ESXi Advanced Settings which meant that this could be automated using standard vSphere Automation Tools that our customers were already familiar with. As part of this exercise, I also discovered the tool currently does NOT support disabling TLS/SSLv3 protocols for the Small Footprint CIM Broker (SFCB) service which is also required if you want to be in full compliance for a particular TLS protocol. Although there is not a direct SFCB API that allows you to manage the sfcb.cfg configuration file, there is still a way we can automate this without requiring SSH to the ESXi host which would technically be the alternative. Lastly, I was a bit surprised to see the TLS Reconfiguration Tool did not have a "query" option for listing the current disabled protocols for all ESXi hosts, but they do have it for vCenter Server itself. While attending an offsite this week, there were some discussions amongst my colleagues about their new Apple Mac Pro and its USB-C only ports. The discussion was completely unrelated to work, however that did get me thinking about the USB-C peripheral market and specifically their ethernet adapters. 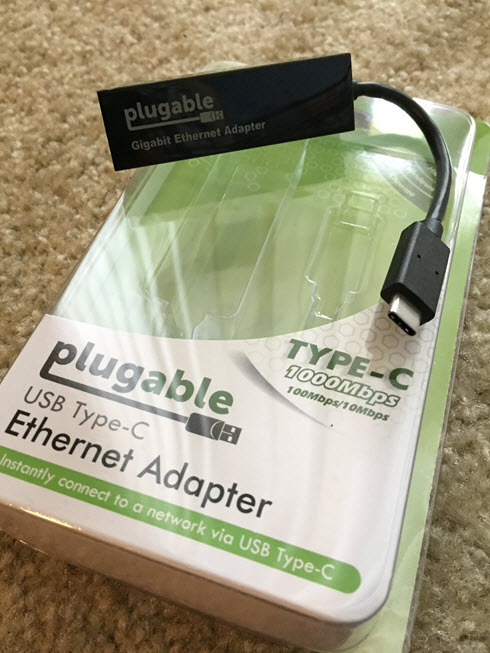 While searching online, I came across several new USB-C to gigabit ethernet adapters that were now available and one in particular that was very interesting, was the Plugable USB-C to 10/100/1000 Gigabit Ethernet LAN Network Adapter. What caught my eye about this specific network adapter was that it uses the exact same ASIX AX88179 driver as my USB 3.0 to Ethernet Adapter ESXi VIBs were built off of! There was a good chance this might just work. As you can probably guess, I was pretty excited and quickly ordered one of the Plugable USB-C Ethernet Adapters. The next challenge was getting access to a system that has a USB-C port. After asking around, I finally got my hands on a Dell XPS 13 which has a USB-C port that I could use for a few days. Funny enough, the Dell laptop only has USB 3.0 and USB-C ports, so the first challenge was to disable Secure Boot since I had built a custom ESXi 6.5 image that included my USB 3.0 Ethernet Adapter VIB. Below are the ESXi VIBs or offline bundles that will be required for this solution. UPDATE (02/12/19) - A new VMware Native Driver for USB-based NICs has just been released, please use this driver going forward. Please see this blog post for more detailed instructions on installing the VIB as well as accessing the vusbX pNIC. Disclaimer: This is not officially supported by VMware. Use at your own risk. Once I got ESXi up and running, I was disappointed to see that the USB-C device was not being detected. I had tried a few more things but nothing worked and I decided to sleep on it. The next morning, I realize maybe there was some additional settings that needed to be tweaked in the BIOS. With a bit of trial/error, I found out that you needed to enable the "Thunderbolt Boot Support" which apparently is disabled by default, at least on this Dell system. 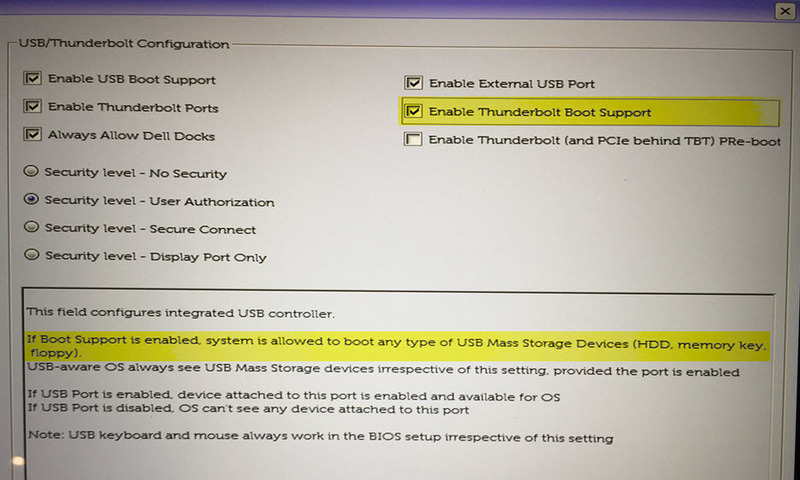 Below is a screenshot of the BIOS USB/Thunderbolt Settings and this was the only change required from the system defaults.